CloudZon is a renowned Android Application Development company who offers professional services in application development. Our efficient team who is skilled and best Android App developers design unique and creative Android applications using the best design, technical knowledge and strategy. The well-acquainted team in Android App programming has delivered more than hundreds of Android applications in the marketplace. The industries our impression has fixed include travel, fitness, health, education, business and many more. We do provide a hassle free atmosphere and ever since it has become the domain of choice as OS for tablets, smartphones, TV and cars. Easily navigable apps with exciting features. Our experienced team develop a robust, interactive Android applications using JAVA programming language with Android software development kit (SDK). Starting from collecting the data required for designing and developing, our experienced team will have a research phase about your app idea, your organization and target users. This phase is the skeleton of an app development. After a thorough analysis, we will plan about the developing the same to be the most creative one. This is one of the crucial steps in the app development. 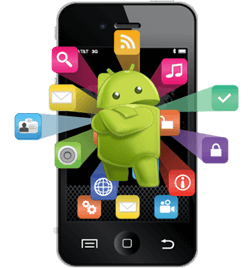 We use most advanced tools and technologies to create your innovative Android app to ensure smooth usability. Before launching a particular Android app, we do double check to assure the quality of the developed application. We believe that this makes us the best among the developers. CloudZon offers upgradation and maintenance facilities for your created app to stay updated. Can amend developmental process anytime. Proudly saying, ClodZone is a step ahead to offer you a comprehensive Android app development of your choice to work as a team of client and outsourcing organization. Our satisfied customers grow every now and then as they simply relied on us for their app.